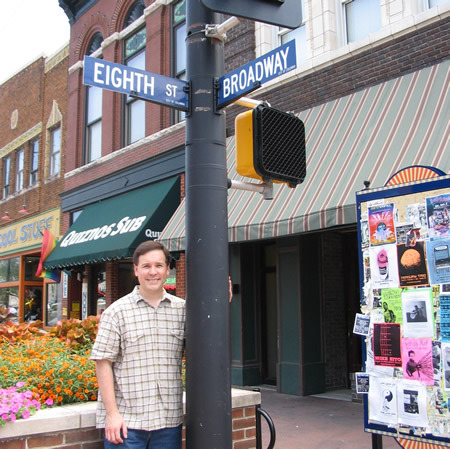 This is the sixth post in a series of our trip to Columbia Missouri. 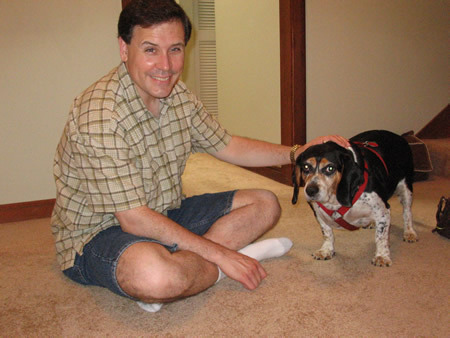 To read what Padre, Panda Bear, and Meerkat were up to in our absence, check out the Furry Bambinos blog. On Saturday morning, August 2nd, we had breakfast at the Hampton, checked out, and then headed over to Patty and Chris’s house for a brief visit. Bruiser was wide awake and roaming! 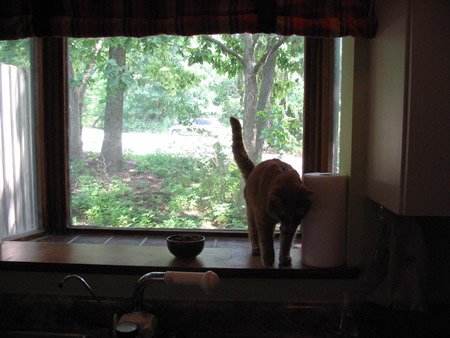 On this Saturday morning, Cinnamon had discovered the wonderful view from the bay window in the kitchen. Unfortunately, we couldn’t catch a photo of him while he slumbered, but you can see he was happy! Chris had a lunch meeting with a colleague, so we chatted with Patty for a little while after Chris left. Then we took some final photos. Of course, we had to have one of the sisters together! 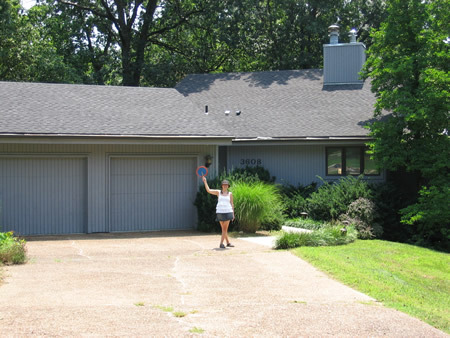 Finally, we said our final goodbyes and pulled away from the house. Patty gave us a final wave to send us on our way! We left Patty and Chris’s house, and went into downtown Columbia to take a few more final photos of things we missed the first time through. 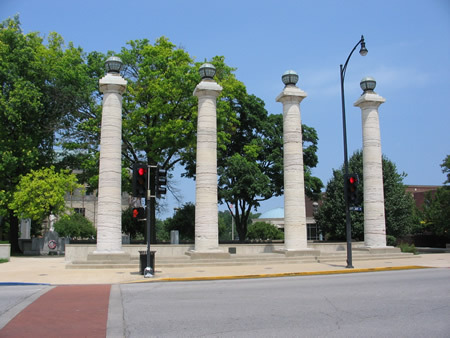 Near the current County Courthouse are these four columns. These are the columns from the original Boone County courthouse from the late 1800’s. Behind those columns are some displays for veterans of every war from the Civil War to the current Iraq conflict, listing names and honoring those who gave their lives for our country. 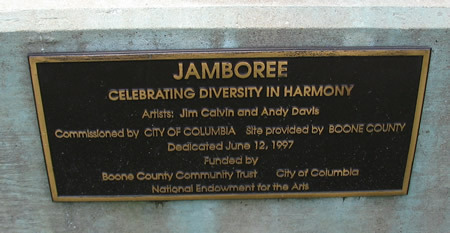 Then, over a wall, on the rear edge of an outdoor amphitheater, is a giant piece of sculpture called “Jamboree”. Here’s the plaque on the side of the granite base. 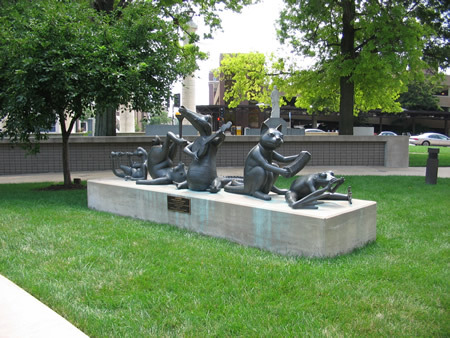 And here’s the sculpture. It features various animals playing different instruments. 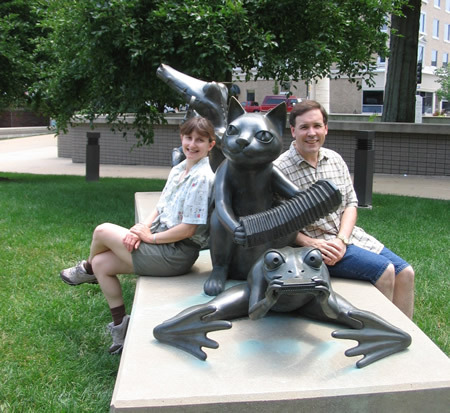 We particularly enjoyed the statue of the cat playing the accordian! 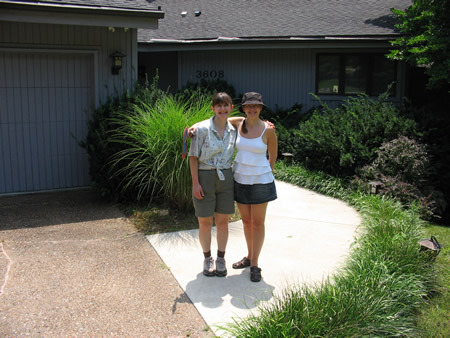 The picture below was taken along one of the sidestreets. It is a public bench. There’s also a different design on the other side. 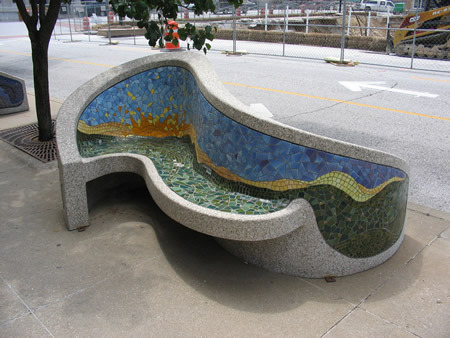 Very unique benches in Columbia! 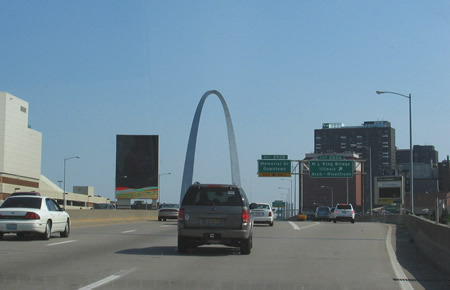 Eventually around 2:00 pm CDT, we hit the road, eastbound on I-70, headed towards St. Louis. 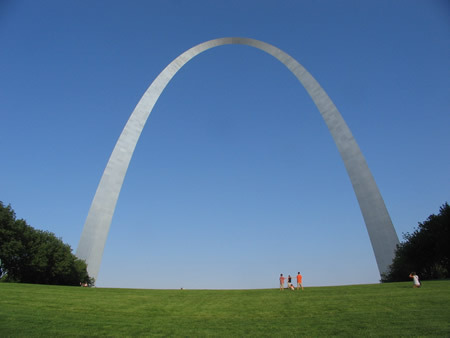 It took us a little under two hours to get to the St. Louis area, where we had planned to do some sight-seeing. Along the way we saw this great series of six billboards. Each board had one of the letters of “MIZZOU”, the nickname for the University of Missouri! 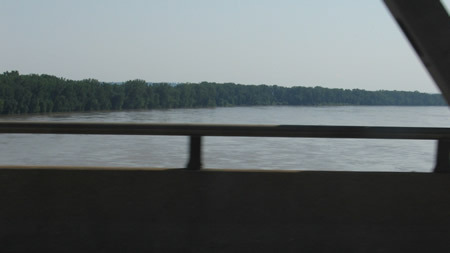 As we approached downtown St. Louis, we had to cross the Missouri River. So, here goes! 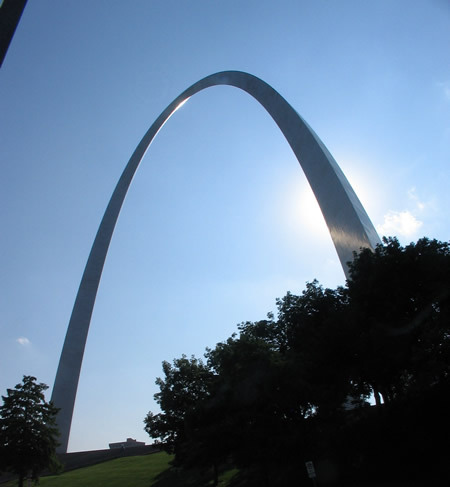 Not long afterwards, we saw the famous Archway of the Jefferson National Expansion Memorial. 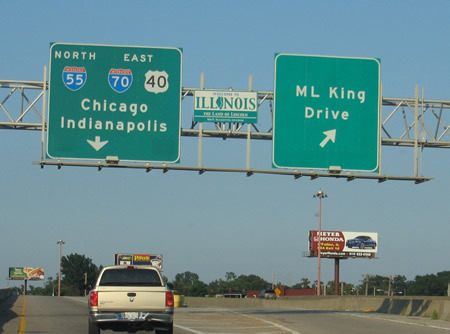 Here we are preparing to exit the freeway to visit the park. 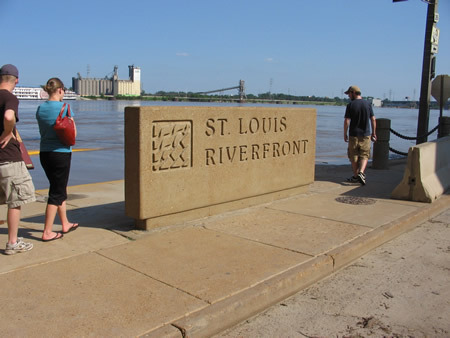 We found a spot in a parking garage right on the waterfront of the Mississippi, and started to take in the scenery. 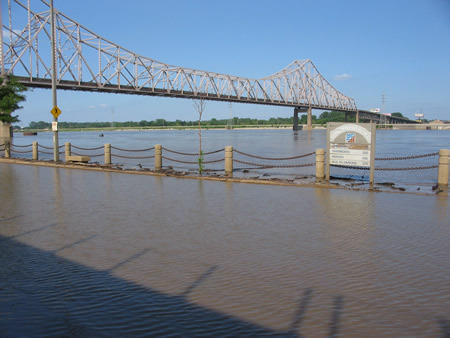 The first thing we noticed was that the water level seemed a little high. Our clue to the water level was that there is supposed to be a road in front of that chain fence! Here’s a better view from the side. No passage! This next photo is really interesting. 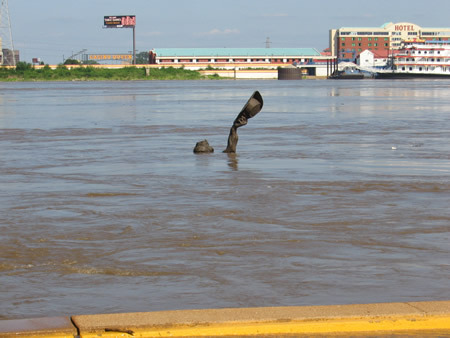 This is the very top of a statue that is submerged in the Mississippi River. 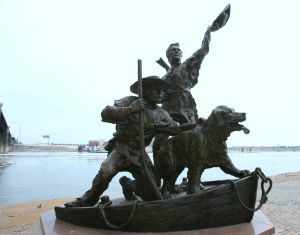 The statue is called “The Captains’ Return”, and is a statue of Lewis and Clark. All we could see was the top of the statue above the water line. 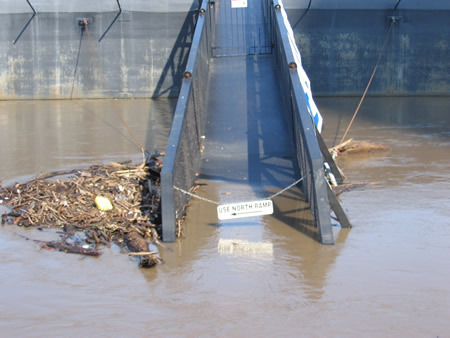 Here’s another sign of the high waterline. 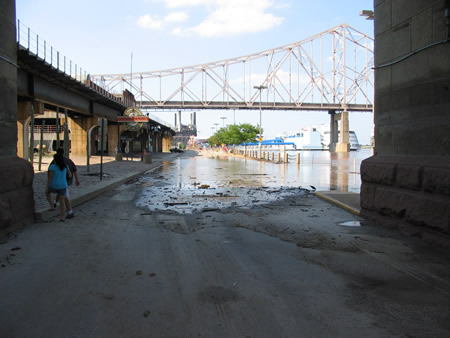 The steps really should go down to the waterfront road which is submerged here. Finally, a view of the arch from the waterfront. This is taken looking West at the arch. 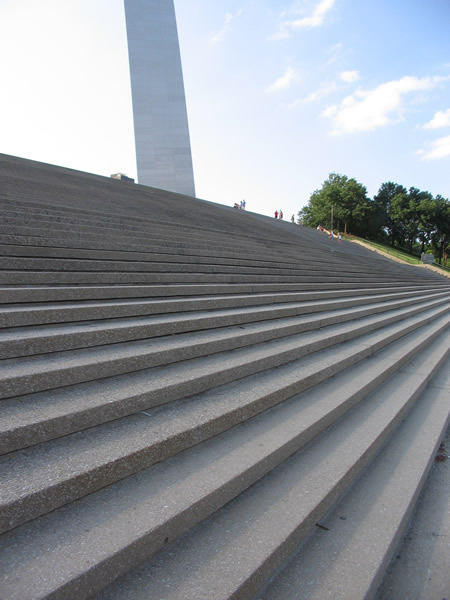 Here are the steps from the waterfront up to the base of the memorial. 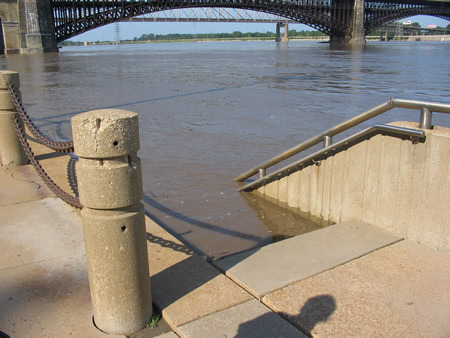 We learned later that there is a plaque on these stairs signifying where the water rose to when the Mississippi flooded the area a couple of years ago. 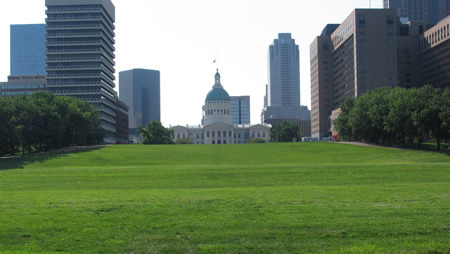 Here’s the view of downtown St. Louis from the top of the stairs, looking West. This was taken directly under the arch memorial. 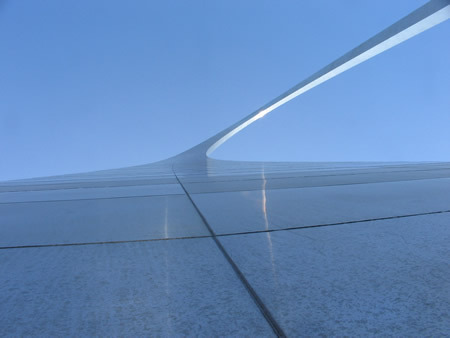 And here’s a view of the arch from a very, very closeup perspective. Makes for an interesting geometric conversation starter! We visited the gift shop in the museum area, located underground beneath the arch. The park security staff did their job thoroughly, passing us through metal detectors, stripping us of all jewelry and belts! We bought the obligatory T-shirts to show we were tourists, as well as an interesting book on the Lewis and Clark expedition. The underground facility was jammed with people … imagine a busy underground “Grand Central Station”. We didn’t have time for the tram ride to the top of the arch on this trip. Maybe next time we’re out here. Once we made our way back to the surface, we circled around to view the arch from the West with the sun at our backs, looking East. Nice view! And here’s another perspective from a little further north. 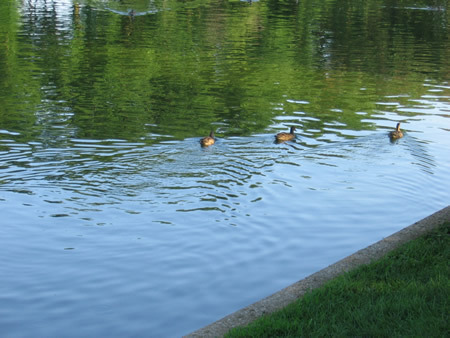 We found a pond / reflecting pool on the grounds of the memorial and saw these ducks quacking their way around the area. Eventually, we made it back to the van after approximately two hours of sightseeing. Time to get back on the road! 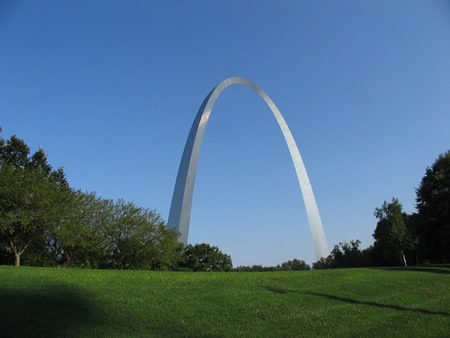 At 6:30pm CDT, we were leaving St. Louis. 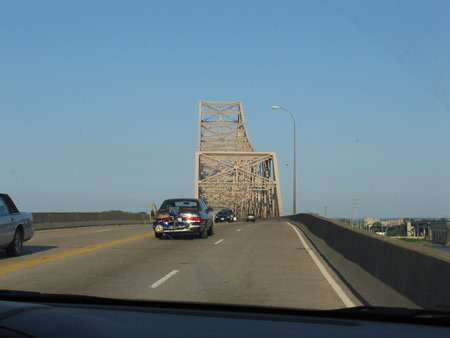 This is a photo of us preparing to cross the Martin Luther King bridge over the Mississippi River. 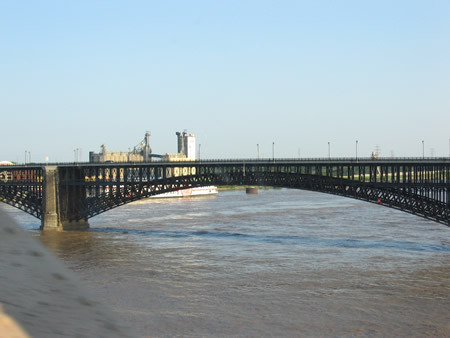 And there’s the mighty Mississippi flowing underneath the Eads Bridge. 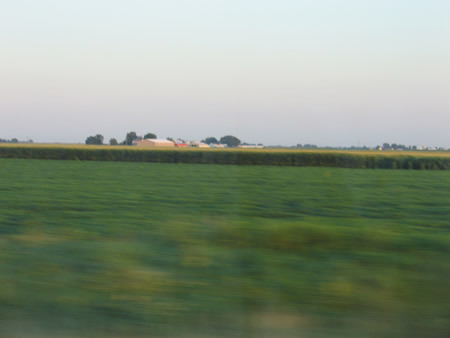 After crossing the Mississippi, we were in Illinois! Yay! 6:37 pm CDT. 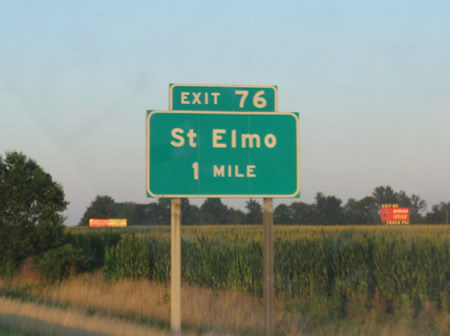 On this Saturday, we got as far as Effingham in Eastern Illinois (or F-ing Ham as Chris had named it) and stopped at a local restaurant for dinner. (8:57 pm CDT) Dinner was delicious, desserts were great, and the meal was relatively inexpensive. David and I decided that this restaurant would be the equivalent of “The Frackville Diner” for the Caban family. The Frackville Diner is along the route between Rockville MD and Hamilton NY, where the Cabans always stop to eat and are considered to be regulars. We tried to find a room at the Hampton in Effingham, but they were sold out, as it was Saturday night. 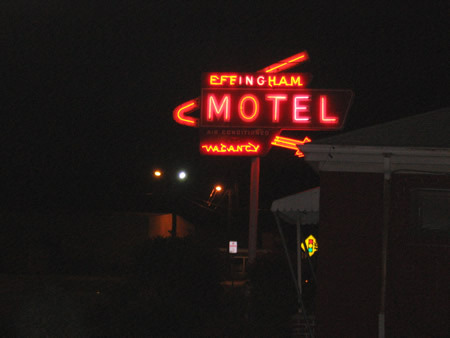 We jokingly considered the Effingham Motel, but … well, let’s just say we rethought our choice after driving by. The next city up the highway was Terre Haute, Indiana, so we called the Hampton there, but they too were sold out. Finally, we were able to book a room at the Holiday Inn in Terre Haute, and we hit the road. 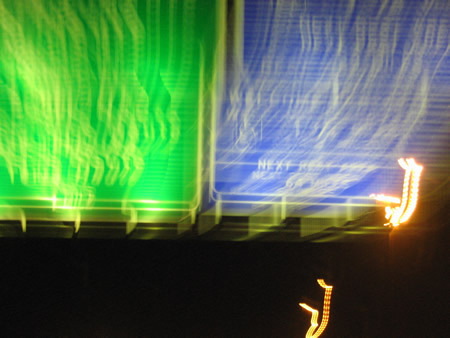 This was a really cool photo of the highway signs at night! We entered Indiana at 10:18 CDT, and immediately lost an hour by crossing timezones! So, it was really 11:18 pm Eastern. We got to the Holiday Inn at 11:30 pm, EDT. Our trip counter read 1206.1, marking 294 miles since leaving Columbia. We unloaded the mini van and hit the sack! Takes for keeping us posted! 2008 Missouri Trip: Day Five: More Sightseeing! 2008 Missouri Trip: Day Seven: From Terre Haute to Home!